Enhanced transcript of panel introductions at the “Technology, the Internet, and Race: Tool for Liberation or Oppression?” session at the recent at 25th annual Computers, Freedom and Privacy conference in Washington, DC held on October 14th, 2015. The transcript is “enhanced” because its links were added by me, the transcriber, and do not mean to imply an acknowledgement or endorsement by the speaker whose words were hyperlinked. Singer: iMix! What I like! What I like! What I like! What I like! Jared Ball (producer @iMiXWHATiLiKE): Good afternoon, everybody. Jared Ball: A’ight, we wanna keep things moving here. My name’s Jared Ball. It’s an honor and a privilege to moderate the next panel. And I just wanted to say, just very quickly, I appreciate Joe Torres and the work he does with Free Press, and that organization in general. And the efforts around these particular kinds of conversations. Because I think one important value of centering the experience of so called people of color in any question is issues of privacy and surveillance supreme among them, is that doing so immediately forces an immediate focus on the imperial and colonizing of the nature of the State itself. Such an approach lends itself to gaining a view from below, from the among the so called wretched, the subjects of colony of empire. And with that said, I want to welcome our panel. Alvaro Bedoya: Great intro for that, thank you, Jared. Everyone, I’m Alvaro. I want to talk about two substantive points to answer this question and one strategy point which we can expand on later if it comes to point, is that surveillance technology doesn’t target everyone equally. It disproportionately targets the weak, it disproportionately targets the unpopular, and so we need to look at privacy as a shield for the weak and as a shield for the unpopular. The second point is that surveillance is often beta tested on vulnerable communities, and we need to start explaining how that happens because I think we’ll create broader coalitions. And that’s the third point: how do we act on this to counter surveillance and to stop it? 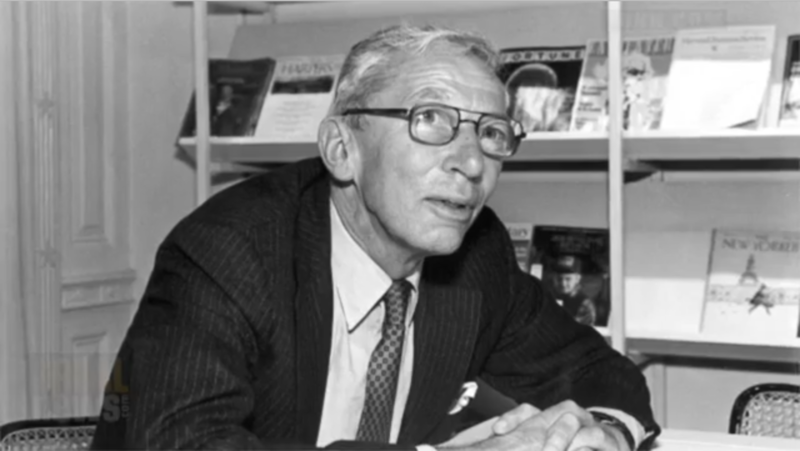 And so, on the first point, I think, and I’m aware that I’m preaching to the choir in large part here, but I think a lot of Americans, when they think of surveillance of vulnerable people, they might know Martin Luther King and the vicious surveillance of Martin Luther King by J. Edgar Hoover. What they might not know is that J. Edgar Hoover also surveilled Cesar Chavez, and also surveilled the Black Panthers. It was critical in the dismantling of that organization. But before [that], it was Japanese-Americans who were surveilled. Before that, it was a W.E.B. Du Bois who was surveilled for trying to go to Europe while Woodrow Wilson was trying to negotiate some pretty lofty principles, and point out that a major population in Woodrow Wilson’s hometown in the United States was not exactly getting that same fair deal. Y’know, after all this it was LGBT service members, and I guess what I’m trying to say is that when unpopular, powerless people meet the gears of government, they tend to lose. And so what privacy is, it’s a space that allows them to do that work without powerful forces stopping them. And I think this is a framing useful for us. The second item: surveillance being beta-tested on vulnerable communities. So, quick story. So, I was born in Peru, I came here when I was five. My grandmother is straight out of a Gabriel García Márquez novel, lives in this old, old house—it’s been crumbling—in a little mountain town in Northern Peru called [TK-NAME OF TOWN HERE]. And, um, for years, I think all of us remember when a long distance call was, like, a really big deal. And for years we would call my grandmother, and it would be a really bad connection, it was a really big deal for us. And uh, the fact of the matter is, probably from about 1993 on, every single time my brother and I called our almost centenarian grandmother in a little mountain town in Northern Peru, the Drug Enforcement Administration (DEA) was making a record of it. And this is kind of the secret history of the “215 program” that folks in this room probably know about, but I don’t think the point has been sharpened in this respect. Before 215, the program that allowed the collection of all of our call records all the time, was a Drug Enforcement Administration program that logged international calls. They were not international calls to just anywhere, they were international calls to mostly all Latin-American areas and certain areas elsewhere. And, um, I remember this story coming out, and no one making the second leap in that sentence. The first leap being all international calls were logged, the second leap being that probably means that if you’re a Latino living in the United States, every time you called your mom, or your grandmother, your grandfather, anyone back home, the Drug Enforcement Administration was keeping track of that. And so, another instance I think you’re going to see this is with facial recognition. The FBI has a fifty-million strong database of faces that State and local law enforcement can use to identify suspects in photos. Before I left Capitol Hill, my boss, Senator Franken, inserted a request, made a request that would include in an audit of the Federal Bureau of Investigation’s facial recognition systems statistics on demographics and on who is in this database. And I suspect what’ll happen if GAO [Government Accountability Office] is able to produce this information is that it won’t be an equal representation of all of our communities in that database. That database is gonna be disproportionately poor, disproportionately Black, and disproportionately Latino. And so I think we need to reckon this fact. Final point, and then I’ll close because I know we just wanted to do brief statements here. When I was a Senate staffer working on NSA reform legislation, and I know some of you have heard it before because I’ve said it to you, I noticed something very troubling. And it was this: we had so many hearings about NSA. We had so many hearings. We had hearing after hearing after hearing and that’s wonderful and each time the administration had sent people and they get yelled at and they would yell back and it was true sort of exchange of ideas, as much as you can have in an unclassified setting. Um, one thing that I never heard in any of those hearings—and I could’ve missed it, but I’m pretty sure I never heard it—was the name Martin Luther King. Or was the name Cesar Chavez. Or was any bit of this history of disproportionate surveillance of vulnerable communities. And, um, I think that’s everyone’s loss. I think that’s our loss because—I think that’s everyone’s loss because they don’t know, but I think it’s our loss because our coalition could be all the more stronger the more we have the civil rights community activated and moving alongside with us. I’ve said this before to someone and they’ve said, “Well, Alvaro, y’know, we don’t really need the Left. We need the Right. We need the Right to get to 60 [votes].” And this person was exactly right. You need the Right, you need Republicans, and God bless them, God bless folks that are in the Republican party that are with us on this surveillance issue, we need those folks to get to 60. But we need the Left to make sure that what we get out of that 60 is actually worth something. Because there are amendment notes after amendment notes and if your coalition is not strong you will lose those votes and you will get a far worse product because of it. So, looking forward, we have a debate about Section 702, which allows for the surveillance of communications collected in the United States with one international—I’m sure I’m getting some tiny piece of that wrong—but, um, in those communications collected are some entirely domestic communications, we now know that. But in those communications are going to be awful lot of communications by immigrants. And this program does not affect everyone equally. It disproportionately impacts immigrants, it probably disproportionately impacts Latinos, and I think we need to put that forward and talk about that. And I think I will close there. Anika Collier Navaroli: Thank you. Thanks everyone, thanks again for coming. So before I talk a little bit about the surveillance and technology piece, I want to talk a step backwards and I want to talk about the notion of privacy as we currently know it. So the way that we typically think about it in these circles is the philosophical or the legal definition. And in doing that I think that we make certain assumptions. And I want to talk a little bit about those assumptions. So, first, I think the assumption that we make is that there is agency over one’s own body or one’s own personhood. And I think the second assumption that we make is that privacy is this thing that exists. And in order to do so I think that we create a certain privilege. And to say that, I want to say essentially that there are certain communities within the United States who have never had the privilege of what I’m going to define as privacy. So, privacy, by “privacy” what I’m talking about is non-surveillance, or a non-monitoring. And so basically what I’m going to talk about a little bit here is the Black community, just because that’s the community that I’m a member of, that’s the one I know the best, and it’s the one that I’ve studied the most. 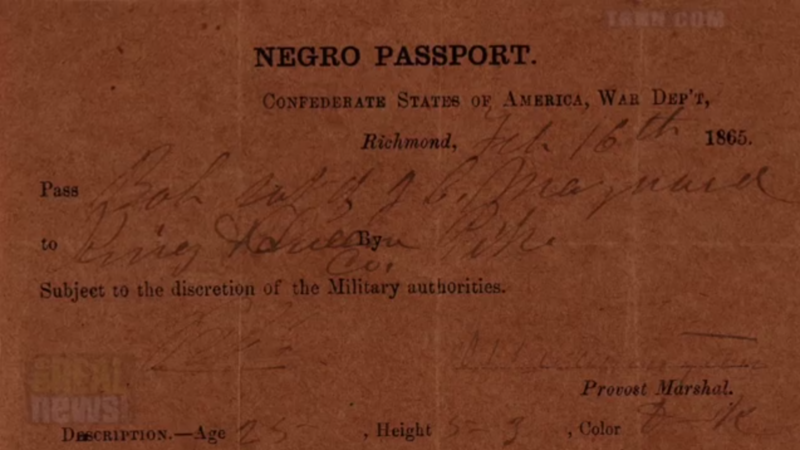 And this was, for those of you who don’t know what a slave pass is, it was a piece of paper that was given to Black Americans back in the day. And this allowed them to physically move from one confined plantation to another. And without this pass, there was a serious risk of bodily harm and/or death. So from the very beginning of Black folks being in America, their physical presence has been monitored and surveilled. And this includes folks that were privileged enough to be free. They had Freed Men Passes, and without these, they were not able to move about freely. And as some folks have seen from “12 Years a Slave,” but those didn’t also always work all the time. So just moving back through history we see from the very, very beginning the notion of privacy as we know it never existed for Black folks in America. And as we move through history, we end slavery, and then we have physical signs that told folks where they could walk, where they could sit, where they could eat, where they could drink, where they could do the very simple things of life. And again, very physical movements of people being monitored, being surveilled, and not following these signs again created a risk of serious bodily harm and/or death. This continued. So we go through what Alvaro was talking about, we know about the civil rights movement of the 1960’s. 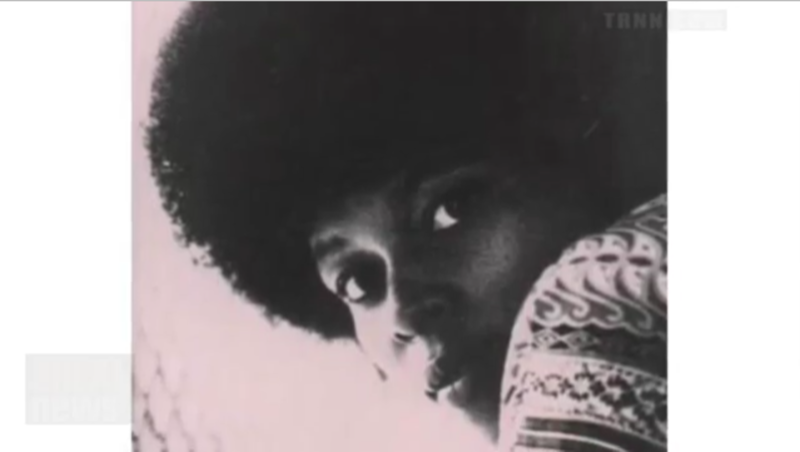 We know about Assata Shakur, in her book she talks a lot about when she became really big—her autobiography, excuse me—when she became pretty big in the Black liberation struggle, there was a certain point at which she stopped receiving phone bills, but yet her phone was never disconnected. Anika Collier Navaroli: And that was the moment that she realized that her phone was in fact wiretapped. And again, now we know what happened. Everything has been declassified, we know about COINTELPRO, we know about J. Edgar Hoover, we know all these things now. But in those movements, not just the physical movements but also the social movements of Black people were being monitored. So, to me, it’s not extraordinary when we think about today’s society. And we think about the fact that the Department of Homeland Security is monitoring Black Lives Matter movement activists at things as simple as concerts. It’s not extraordinary to me that there are allegations in Chicago of Stingray devices being used to monitor the movements of protesters as they move about the streets. These things are not extraordinary in that the existence the privilege of privacy never existed for Black folks in America and to this day is not a notion that is really known. And so I kinda want to start my thought process there and just realize and ground this conversation in the knowledge that when we talk about surveillance, when we talk about technology, we are talking about brand new tools for a thing that has always been going on. Hamid Khan: Hi, good afternoon. My name is Hamid. I am from Los Angeles with the Stop LAPD Spying Coalition. I want to start off by just picking up where Anika stopped where, what I gathered was, for many communities historically speaking and even currently as well, privacy is a luxury, it’s not really a right. So I think that’s something that we need to really just at least acknowledge and put it out there. Secondly, since yesterday, if I was not working on the ground on the streets, just organizing out in Los Angeles, one would assume that surveillance is purely a Federal issue whereas the local police is kept completely out of the equation most of the time. And when you look at history, before the FBI came into existence, the police Red Squads were very much in operation. And the police Red Squads didn’t start because the Russians were coming. The police Red Squads started in the 1880s because of the Haymarket strike in Chicago. That was the formation. In 1886 Haymarket happens. In 1888, Chicago police department is the first department to formally incorporate a section which was going to engage in covert intelligence gathering and surveillance of communities. And from there on, we see this rapid escalation of the Red Squads. So local police is and has always been on the forefront of surveillance, spying, and infiltration. There was a conversation about Stingrays, there was a conversation around automatic license plate readers, the Los Angeles Police Department has all these tools. We talked about Fusion Centers, the Los Angeles Police Department has its own internal Fusion Center as well. New York Police Department works closely with the CIA. So the point I’m trying to raise is that locally law enforcement have been on the front lines of surveillance, spying, and infiltration. Which brings me to the point then, of how does it impact communities, and particularly communities of color. And most of the time the conversation starts from impact, rather than core concepts. Like, y’know, okay, well, this is what has happened, without us backtracking and seeing what has been the history behind this thing. Another thing that Anika raised was that this is not a moment in time, this is a continuation of history. The implication that lower-class culture is pathological seems fully warranted. Rather than waste time and public money implementing policies based on the false notion that all men were created equal, better to just face facts and acknowledge the natural divisions that exist. Members of the lower classes should leave school in ninth grade, to get a jump on a lifetime of manual labor. The minimum wage should be replaced to encourage employers to create more jobs for “low-value labor.” The state should give “intensive birth-control guidance to the incompetent poor.” And the police should feel free to crack down on young lower-class men. So that “the police should feel free to crack down on young lower-class men.” This is the origin of “Broken Windows” policing. So this is the tally as of yesterday how many people have been murdered by law enforcement in the United States as of 2015. Nine-hundred and two already. This is a tally that was started by The Guardian. It’s called “The Counted.” And when you do the math, every seven hours and thirty-six minutes, someone is being murdered by law enforcement. I mean, just posit this for a second. Every seven hours and thirty-six minutes. Today, as we sit here, more than three people on average will be killed by law enforcement. And look at the numbers. Los Angeles leads that. Eighteen already in 2015. When you look at per-million, 5.24 Blacks per million. 2.42 Hispanic/Latino per million. 2.1 white. So 250% is the disparate impact on the Black community on how law enforcement is murdering them. How is the law enforcement responding when we go and protest this? Can you go to the next slide, please? This is what we look at. This is what we are facing. 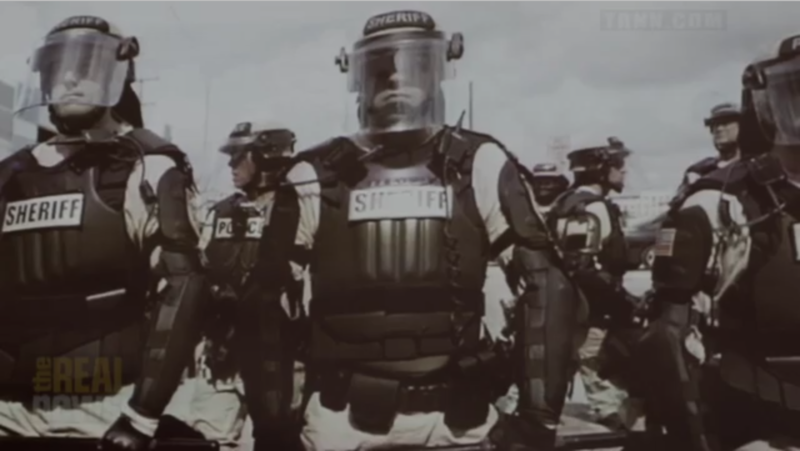 This is the intense militarization of the police. This is when we go out onto the street. This is how we are met. This is how we are brutalized. So when somebody talks about privacy and then people talk about “hacking,” the previous slide shows how families are being hacked. How their spirits are being hacked. How trauma is being created. And this is what is going on the streets of Los Angeles. And the last couple of slides I just want to show, if you wanna go to the third one. This is now happening. 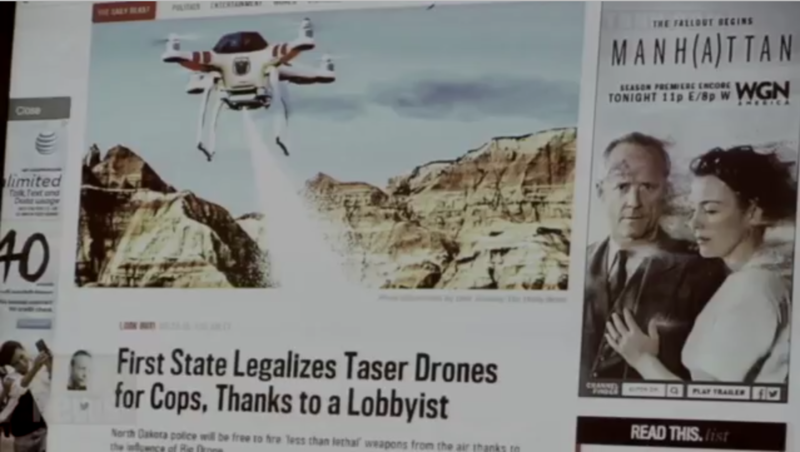 North Dakota is the first State in the country that is now authorized law enforcement use of drones armed with “non-lethal weapons,” as if tasers and rubber bullets have never killed people. And lastly I just want to show you a slide. This is what we are facing. 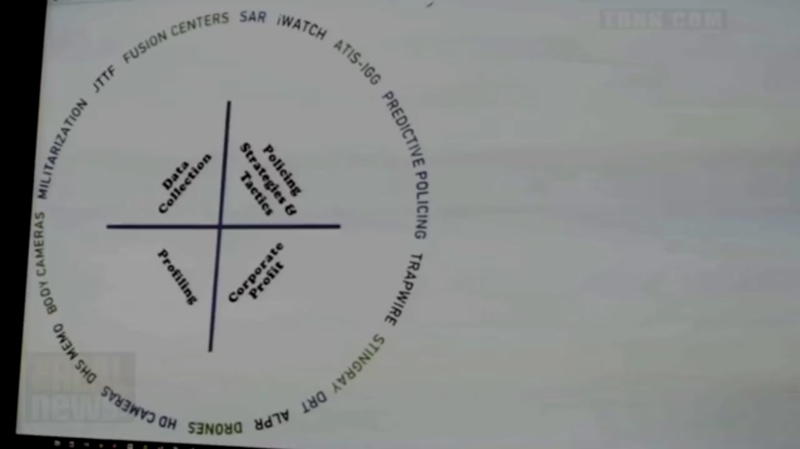 This is the LAPD’s architecture of surveillance, something that we know now. From Fusion Centers to Suspicious Activity Reporting (SAR) program, to “See Something, Say Something,” to the Intelligence Gathering Guidelines where they can legitimately now place informers in political groups where they can also, the cops can take fictitious personas and fake identities to Facebook or social media. 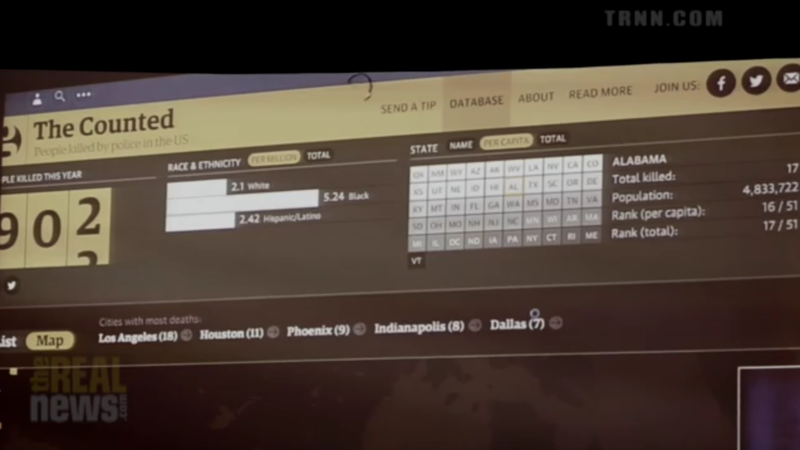 Then you look at Predictive Policing, then you look at TrapWire technology, which is a street-level camera that picks up your body image and immediately transfers it to the Fusion Centers, to Stingray, and then somebody was saying that Stingray is not going to be used because now they’re using “dirt-boxes,” the Digital Receiver Technology, which is Stingray on steroids. And then we move into the Automatic License Plate Readers (ALPRs), Drones with high-definition cameras. The DHS memo basically, and this is what leads to the how police begin surveillance of poor people, because my work is based out of Skid Row in downtown Los Angeles, where gentrification is running rampant, and one of the things this memo said was it took three small cases of low-level arson and they put a memo out that said if there is any housing rights activists, that if there is any rally or if there is anything going on, that should be considered a suspicious activity, and a Suspicious Activity Report should be filed on housing rights activists. And then we see the militarization, Joint Terrorism Task Force, and the Fusion Centers. And I want to end by saying that as we are looking at this, who ultimately is going to pay the price? I mean, when we look at the murders on the street, the most recent audit of the Los Angeles Police Department’s Suspicious Activity Reporting, two years ago, came out that—now these are counter-terrorism programs, most of the police now is heading towards counter-terrorism and counter-insurgency—that all the SARs that were sent to Fusion Centers, over thirty-one percent of them were filed on Los Angeles’s Black community, the community that is less than ten percent of the population. A three-to-one disparate impact. In the gender count, fifty percent of these SARs were opened on Black women. These are counter-terrorism programs. Lastly, the Los Angeles Sheriff’s Department has now become the largest repository of biometrics, they have now a database where they can gather biometrics on fifteen million subjects, and that is an extension of the US military (Navy and Marine) program called the Identity Dominance System, which started in Afghanistan where they had basically taken everything off of the whole population of Afghanistan and now as of this month are launching into the second phase, which is called the IDS-2, Identity Dominance System 2.0, where they are going to start looking at a person’s gait, how you walk, how you move your hands and your arms. So in essence, what we are seeing is now that speculative policing is going to the next level. Because what this all is, it is speculative policing, and I’ve reached my time, so I’ll stop right there. Singer: iMiX! What I like! What I like! What I like! Pair with David Whitehouse on the disturbingly intimate relationship of policing and schooling.